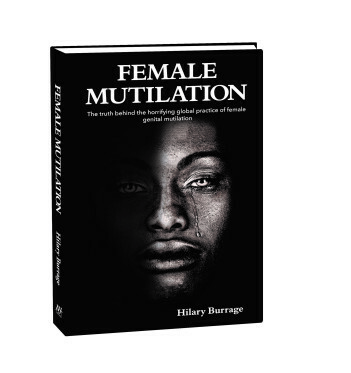 Female Mutilation is a book by Hilary Burrage about female genital mutilation (FGM), a harmful traditional practice which occurs in both ‘developing’ and ‘developed’ countries across the globe. The book, published in early 2016 by New Holland Publishers, is available from bookstores and sellers everywhere, including via Amazon.co.uk / Amazon.com and at 30% discount from the Guardian bookstore. Female Mutilation comprises largely the narratives of around seventy people in many parts of the world, some of them actually survivors of FGM or the family members of survivors. Other contributors include globally distributed campaigners against the practice from many walks of life – community activists, clinicians (midwives, doctors etc), lawyers and the police, teachers, social workers, policy makers and politicians. In almost every part of the world FGM is now illegal, but it is thought nonetheless that over three million women and girls undergo it every year. Initial estimates for the early twenty-first century suggested there are around 140 – newly revised (2016) to 200 – million women and girls globally living with the consequences of genital mutilation, with perhaps another ten percent of those who have undergone it having actually died directly as a result of this violence. I grew up and work in Iran. When I started campaigning against FGM I had only one laptop and the support of my mother, and we have continuing problems with funding. Every day, from when I wake up and answer my messages, I am busy.